This year we decided to donate to Charity in lieu of Christmas Cards so our local Lazonby First Responders who have attended guests in need of urgent medical attention have benefited. We have posted a Voucher which currently offers previous guests and their friends as well as colleagues a 15% reduction off any full priced 7 day stays completed before 16th, March of 10% off Weekend (Fri to Mon) or Mid-week Breaks (Mon to Fri)—it certainly will make someone happy. Reservations must be booked at least 10 days prior to arrival and is subject to availability, contact us direct eith by email or phone from our website. Penrith is more than supermarkets, it is a “Real Life Shopping Experience” with a wide variety of individual stores where service is not extra and prices inline with what is being offered elsewhere. The town has three local butchers all of a high standard and Cranston’s also run the Cumbrian Food Hall on the edge of town where they produce a tasty Cumberland Sausage which our family have enjoyed for over 25 years, but we now prefer the Cumberland Sausage found at Little’s the butcher in Devonshire Arcade, Little’s recipe is just a little spicier. ﻿﻿﻿﻿﻿﻿ ﻿ In 2011 Cumberland Sausage was awarded “Protected Status” so must be now produced in the County of Cumbria and made to specific ingredient quantities. 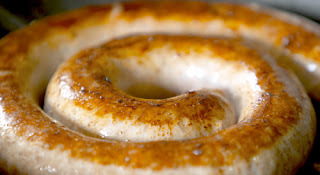 The legend of Cumberland Sausage probably started around the West Cumbrian port of Whitehaven which imported a lot of spice and sugar from the Indies but before docking in Whitehaven some of these taxable items were unloaded at the Freeport on the Isle of Man and then smuggled across to the Cumberland Coast. The smuggles would often hide out in farms and leave some of the contraband as payment for the farmer’s hospitality and silence. Of course the Custom men were constantly on the prowl and so the story goes the farmers wife was making sausage when she became aware of the imminent arrival of the customs officers and in her desperate bid to conceal the spices left by the smugglers she threw the lot in with the sausage mix and continued to make the sausages, so was born the recipe for Cumberland Sausage. 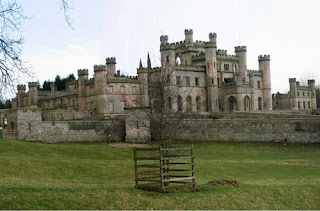 ﻿﻿﻿﻿﻿﻿﻿﻿﻿ Lowther Castle and the rejuvenation of the Castle gardens has moved quite a pace since our Blog of September 2011 and so the gardens should have developed to be well worth another visit this year. 130 acres of gardens must take a lot of up-keep and obviously employed numerous gardeners at one time. The Courtyard Café is now open and this grand setting adjacent to the old castle is, on a beautiful Cumbrian day, an idyllic place to relax for a while, then view the ruins now in an advanced stage of restoration. The Castle will not at this stage be fully restored but brought back to provide a safe environment which can be used to tell the tale of the Lowther families who lived there. With a plethora of country walks within the Lowther Castle area the Courtyard Café has become a welcome staging post. The Lowther family have lived at Askham Hall since the demise of the castle and here also has been developed a Tearoom in the old farm buildings, it certainly has created an old worldly atmosphere—not tried the stone baked pizza’s yet but had good reports. ﻿﻿﻿﻿﻿﻿﻿﻿ From Askham it is a reasonably gentle uphill stroll to the top of Heughscar Fell from where there are great views over Ullswater and the Helvellyn Range of fells. This is one of those viewpoints accessed with not too much effort yet offering really rewarding views, as with Castle Crag and Walla Crag in the Borrowdale Valley. As you headed on up towards Heughscar Fell you are sure to see a herd of Fell Ponies, who's ancestors probably roamed this area even before Roman Times. Before the days of mechanization, the Fell Pony was a "jack-of-all-trades,' shepherding on the fells of England's Lake District, working as a light farm animal and pulling the family carriage when required. For centuries the Fell Pony’s major role was as a pack or pannier pony carrying goods of all kinds. 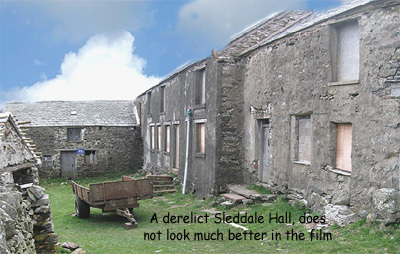 Their work was both local and long distance, particularly carrying wool from the Lakeland fells to the merchants and lead from mines to the coast for smelting. 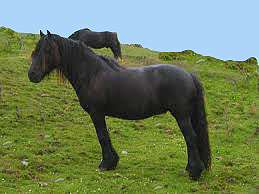 Today, Fell Ponies are popular for both riding and carriage driving. 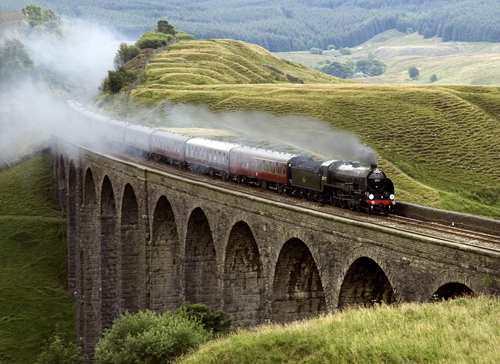 ﻿ The Carlisle to Settle Railway (though it goes to Leeds) has had a chequered history, on being threatened with closure - there was outrage: critics of the closure pointed out that this was a main line, and the campaign uncovered evidence that British Rail had mounted a dirty tricks campaign against the line. However it was saved and is now a thriving and very scenic route. The short journey from Langwathby or Lazonby to Carlisle runs adjacent to the River Eden and is well worth enjoying. 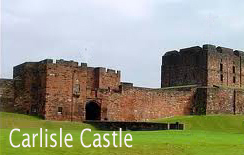 Castle visits as a small boy were an extremely boring experience things have changed, the Castle and Museums in Carlisle are fun and interesting. 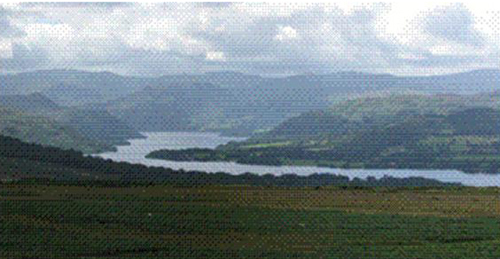 Ullswater Lake and surrounding valleys and fells with many easy and difficult walks or climbs. Northern Pennines - European and Global Geopark great walks through varying wildlife habitats.